Daniel Ricciardo says he departed Red Bull with no regrets over his five years on the team as he gears up for the 2019 campaign with his new employers Renault. The Australian has previously expressed frustration at Red Bull's fall from F1's dominant team immediately after his arrival. When Ricciardo was promoted from Toro Rosso in 2013, he entered a team that had won the drivers' and constructors' titles in each of the past four seasons with Sebastian Vettel. Although the Australian ruffled Vettel's feathers, winning three races in his debut campaign, Red Bull are yet to return to their former glories and Ricciardo's seven grand prix wins in five years might represent a disappointing total. However, as he embarks on a new venture with Renault, themselves looking to break into the fight for honours, he will only look back on his Red Bull stint fondly. 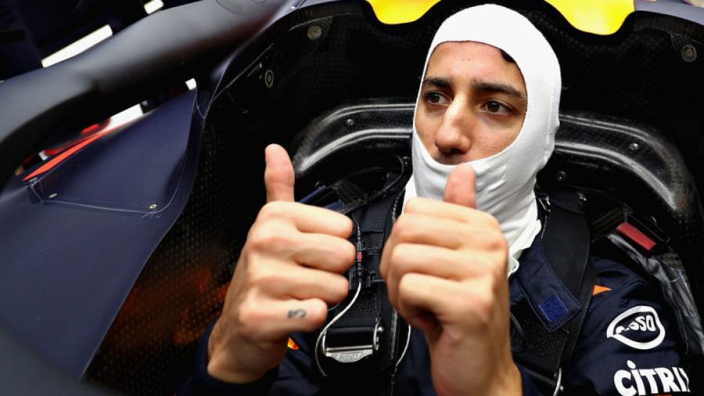 "No, I wouldn't say any regrets," Ricciardo told RACER. "Not at all actually. "I guess as well I never really had many other options anyway, so it's not like I could have signed with Mercedes two years ago and I didn't want to or whatever. So no regrets. I'm happy. "I don't ever feel like I've cheated myself, if you know what I mean, and some of my best weekends have been when I've been more chilled about it and less intense. But I think I've found that balance, so no regrets." MORE: Verstappen's 2019 helmet design leaked?